Treadway's November 18th Art & Design auction features an exceptional collection of American and European Art Nouveau glass, combining two collections built over 40 years by a Los Angeles couple and a midwest gentleman. This sale includes rare and early works by Galle and Daum, Tiffany and Loetz as well as an outstanding collection of shades by Quezal, Steuben and Tiffany. 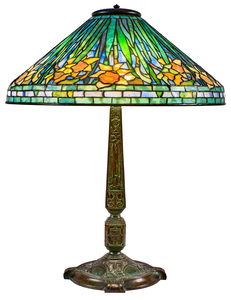 The auction also contains a large collection of over 50 lamps by Tiffany, Handel and Duffner Kimberly. Also in the auction is a rare and monumental Tiffany & Co. silver and ivory vase along with other Tiffany & Co. mixed metal pieces. 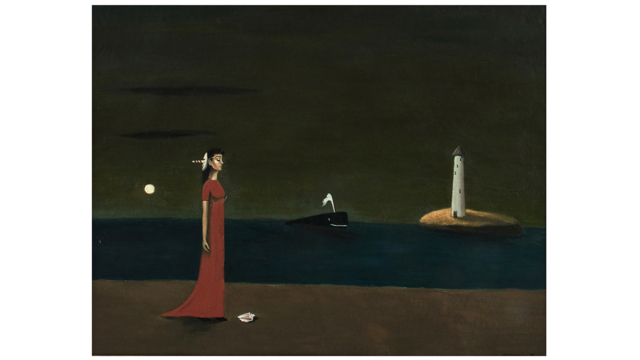 The fine art available in this sale features one of the best and largest paintings by Gertrude Abercrombie to ever hit the auction market. This painting has been in multiple museum exhibitions. Other fine art selections include works by Percival Rousseau, John Hauser, Irwin Shope, David Klein, Leonard Tsuguharu Foujita, T.C. Steele, John Dee Wareham, W.L. Stevens, Bernard Corey, Leon Bibel, Arthur Halow, Harold Dunbar, Clyde Singer and Manierre Dawson. Furniture includes examples by Gustav Stickley, George Nelson, L and J G Stickley, Sam Maloof and a group of pieces from a Michigan home by George Nakashima. There are numerous examples of American and European ceramics including works from the early 1900’s thru late 1900’s. The selection ranges from Galle to Teco, Grueby, Pewabic and Newcomb to many of the modern studio potters like Natzler, Grotel and Cabat. A good selection of Italian glass includes a rare piece of Artisti Barovier. There is a Rookwood collection from the family of John Dee Wareham, the past president of Rookwood Pottery, most of which have never been for sale or seen since he acquired them in the 1950’s. In all, there are over 500 lots of decorative objects. Preview will be held at Treadway located at 2029 Madison Road, Cincinnati, OH 45208 with the auction being held at 2007 Madison Road beginning at Noon on Sunday, November 18th. Preview dates are Monday, November 12 thru Saturday, November 17, 9am-5pm or by appointment. Floor, phone, absentee, Liveauctioneers bidding will be offered. As they have since their beginning in 1980, Treadway guarantees everything they sell so bidders can be confident in buying.